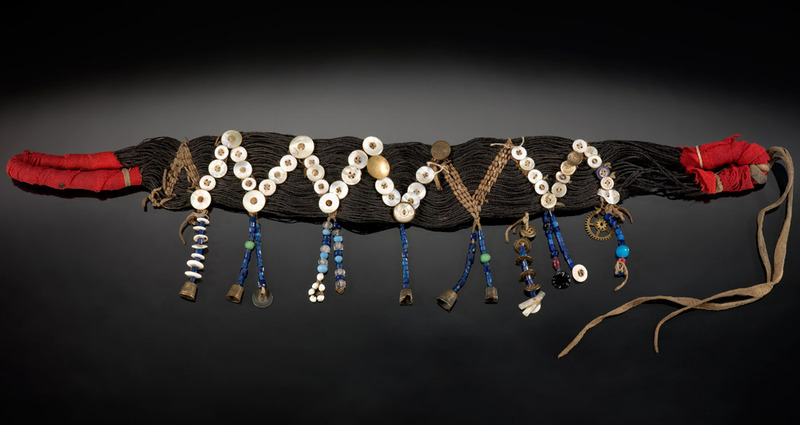 Shasta belt, from the collection of the National Museum of the American Indian. Welcome to the research guide for Native American Studies. This guide provides search tips and links to research resources for topics related to Native American history and culture. Follow the tabs above to find help, specific tools, and searching techniques. Finding materials online and in the library can require using a variety of different words. It is a good idea to write down as many terms as you can think of before and during your research. Individual tribal names and groups may have various spellings. For example, many tribes may be grouped under the name of Sioux or Sioux Nation, instead of their individual names, or a resource might only use the individual tribes’ names instead of Sioux. Get some background on the Native American tribes in reference books. Those that begin with the letter “R” are located by the Reference Desk. Books on the Reference shelves with numbers R 970 through R 970.9 cover Native American history and cultures. Books with the number R 299.7 discuss Native American mythology and healing practices. To access these books from off campus, you will need to log in using your Pipeline username and password. Gale Virtual Reference Library: Contains the full text of encyclopedias and specialized reference sources. Use the library catalog (books+) to find books about Native Americans, in both print and ebook format. Your search results will include articles as well. Limit to books by choosing the appropriate box from the menu to the left of the results. Use one of the following databases to find articles from periodicals (newspapers, magazines, scholarly journals) about Native Americans. To access databases from off campus, you will need to log in with your Pipeline username and password. Academic Search Complete: Provides full text for more than 8,500 periodicals (magazines, newspapers, and scholarly journals), including full text for nearly 7,300 peer-reviewed titles, in all subject areas. The database includes PDF content going back as far as 1887. Searchable cited references are provided for more than 1,400 journals. Ethnic NewsWatch: Included are journals, magazines, and newspapers from ethnic and minority presses. The current collection, Ethnic NewsWatch™, covers 1990-present, and the historical collection, Ethnic NewsWatch: A History™, spans 1959-1989. History Reference Center: Covers all time periods of U.S. and World History. Provides full text from more than 1,620 reference books, encyclopedias and non-fiction books, and cover to cover full text for more than 150 leading history periodicals (magazines, newspapers, and scholarly journals). Includes primary source material such as historical documents, photos, and maps. Also includes biographies of historical figures, and more than 80 hours of historical video. JSTOR: Contains articles from hundreds of scholarly journals covering a wide range of subjects in the arts, humanities, sciences, and social sciences. Full text articles are available, from the first issue (sometimes going back over 100 years) until five years ago. Primary sources are first-person accounts or direct evidence of the topics or events you are researching. They may include letters, diaries, photographs, autobiographies, records such as birth certificates or land deeds, treaties and other government documents, news footage and eyewitness articles, plays, movies, works of art, speeches, interviews, oral histories, memoirs, architectural plans, and many other kinds of artifacts. Secondary sources analyze, summarize, interpret, or comment on primary sources. They are usually created by someone who did not experience an event first-hand. They may include biographies, scholarly journal articles, literary criticism, political analysis, news reports other than first-hand accounts, reference books, and textbooks. Some sources may be considered primary or secondary, depending on how you use them. For example, a 1969 newspaper article that discusses the moon landing that year could be considered a secondary source. But if you are interested in how NASA was portrayed by the media during the Cold War, the same article could be considered a primary source as an historical artifact. Watch Newspapers – Primary Source? for more information. Some of the library databases include primary source materials. To access these resources from off campus, you will need to log in with your Pipeline username and password. History Reference Center: When you search for your topic, use the ADVANCED SEARCH and select PUBLICATION TYPE = PRIMARY SOURCE DOCUMENTS. Or you can select the PRIMARY SOURCES tab found in the menu to the left of the list of results after your search. American Museum of Natural History North American Ethnographic Collection: Images of culture objects from North America. Cline Library Digital Archives: Digital Archives of the Colorado Plateau. The Library of Congress American Memory Project: Several online exhibits on regional Native American history. National Archives Native American Heritage: Find information relating to American Indians from as early as 1774 through the mid 1990s. Native American Heritage Month Exhibits and Collections: Includes primary sources and information about exhibits. Online Archive of California: Provides free public access to detailed descriptions of primary resource collections maintained by more than 200 contributing institutions. Project Jukebox: From the University of Alaska Fairbanks. Includes oral histories of Native and Non-native Alaskans. Center for World Indigenous Studies: List of links related to indigenous peoples from around the world. Federal Websites – Native Americans: Oklahoma Department of Libraries guide to federal agency websites that feature information for or about Native Americans. Most of these websites focus on tribal matters. Indian/Native American Resources: From the Arizona State Library, Archives and Public Records, Law and Research Library Division. National Native News: Native news from Koahnic Broadcast Corporation (KBC) –a nonprofit, Alaska Native governed and operated media center. National Congress of American Indians (NCAI): A directory of contact information and websites for tribes affiliated with the NCAI. Native Languages of the Americas – List of Native American Indian Tribes and Languages: Alphabetically organized list of Native American Tribes and Languages with a large list containing links to translations and much more information on each tribe. The American Indian and Alaska Native Population: 2010 census information. Race/Ethnicity and American Indian & Alaska Native Documentation: From the American Community Survey by the United States Census. For Tribal Governments and Native Americans: From USA.gov containing online services and resources on law, jobs, housing, health, tribes, and more. National Native American Graves Protection and Repatriation Act (NAGPRA): NAGPRA page containing the Culturally Unidentifiable Human Remains Inventories (CUI) Database, grants to assist Natives, and other information regarding NAGPRA. Native American Constitution and Law Digitization Project: A joint project between University of Oklahoma Law Library, The National Indian Law Library of the Native American Rights Fund and Native American tribes providing access to the Constitutions, Tribal Codes, and other legal documents. U.S. Bureau of Indian Affairs: Established in 1824, Indian Affairs (IA) is the oldest bureau of the United States Department of the Interior and an umbrella bureau for all federal services to Native Americans. The page contains information about education, gaming, economic development, tribal government and land/water resources. American Indian Movement: The official website of one of the preeminent, but sometimes controversial, organizations working on issues related to Native rights. Includes official statements, podcasts, and streaming audio news. Alaska Native Heritage Center: Excellent reference resource containing information on the different cultures of Alaska: Athabascan, Unangax and Alutiiq (Sugpiaq), Yup’ik,Cup’ik, Inupiaq, St. Lawrence, Island Yupik,Eyak, Tlingit, Haida and Tsimshian. Alaska Native Knowledge Network: From University of Alaska, Fairbanks. Hopi Cultural Preservation Office: Official site for the Hopi containing information about current and past research projects. National Indian Gaming Association: The official website for the National Indian Gaming Association (NIGA), a non-profit organization representing 184 Indian Nations gaming policy and interests. National Indian Gaming Commission: Federal regulatory website. Chumash Indian Museum: Located in Thousand Oaks. Native American Heritage Month Exhibits and Collections: A large collection of exhibits and collections from the National Archives, Library of Congress, National Parks Services and more. Site contains some primary sources. National Museum of the American Indian: Information on the many exhibits and collections of NMAI. Includes searchable online collection of peoples/cultures, artists/individuals, places, and object specifics. Very useful. Native Networks: Information about and listings of media (film, video, and radio) by and about the Native experience. Focuses on the Americas and Hawaii.